"You get involved with the likes of him and I guarantee you'll get hurt. Championship means more than your father!" 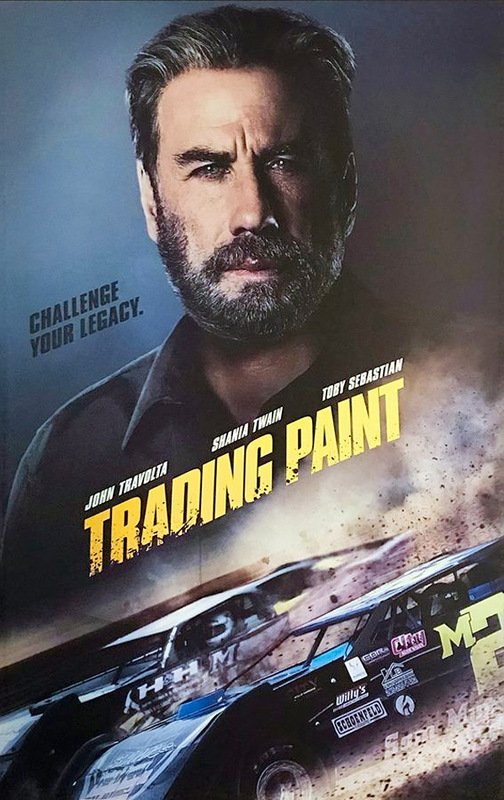 Saban Films has released the first official trailer for an indie race car thriller titled Trading Paint, from director Karzan Kader (The Last Four, Bekas). The film is about a small town rivalry between a veteran race car driver and his son, as the son decides to go out on his own in hopes of winning more races. John Travolta stars, with his son played by Toby Sebastian, along with Michael Madsen, Kevin Dunn, Shania Twain, Buck Taylor, and Luis Da Silva. This is a rather intense trailer for a movie about race car drivers, but it is an intense sport so I guess it makes sense. Travolta seems to be enjoying this role. Veteran race car driver Sam (John Travolta) and his son Cam (Toby Sebastian), a fellow driver from a small town overcome family and professional conflicts, balancing competition, ego, resentment and a racing nemesis to come out stronger on the other side. Trading Paint is directed by Kurdistan-Swedish filmmaker Karzan Kader, director of the feature films The Last Four and Bekas previously, as well as a few other short films. The screenplay is written by Gary Gerani and Craig R. Welch. Saban Films will release Kader's Trading Paint in select theaters starting on February 22nd coming up. Anyone interested in this?